Dubai, UAE, March 19, 2018: If you are looking to stock up on baby care essentials or for beautiful fragrances suitable for babies & kids, look no further than Glambeaute.com, the one-stop shop for beauty and wellness in the UAE. French brand, Corine De Farme available on Glambeaute.com helps protect your new born baby’s skin with products that are made from more than 95% of natural origin. The products are hypoallergenic, paraben free and dermatologically tested. Soap and sulphate free, this Baby Hair & Body Wash is perfect every day to gently cleanse your baby’s skin and hair. Enriched with Calendula extract known for its soothing and softening properties and with moisturising agents, it respects baby’s sensitive skin. This ultra-gentle sensitive formula is suitable for new-borns. Leaves the skin soothed, moisturised and lightly scented. Leaves hair soft and silky. Ideal to gently cleanse and protect baby’s sensitive skin. Its soft formula is enriched with Calendula extract known for its soothing softening properties and with moisturising vegetable Glycerine, baby’s skin is left supple, moisturised and lightly scented. A very gentle foaming formula ideal for a real moment of tenderness with your baby. Ultra-rich, it leaves the baby’s skin soft and delicately perfumed. Enriched with almond oil, known for its nourishing and softening properties, this body oil moisturises, preserves skin softness and leaves it lightly scented. Its soft texture makes the massage easier with a dry, non-sticky effect. These wipes cleanse and refresh baby’s face and hands. Perfume free, the wipes hydrate and soothe, leaving the skin clean. Perfect for use at home as well as on-the-go. While buying a perfume for a baby or child may not be up there on your essential to-buy list along with bath essentials and wet wipes, it’s not to be sniffed at. Glambeaute.com offers a wide range of fragrances for kids that are mostly made up of water, meaning you’re not exposing delicate skin to alcohol or other nasties. 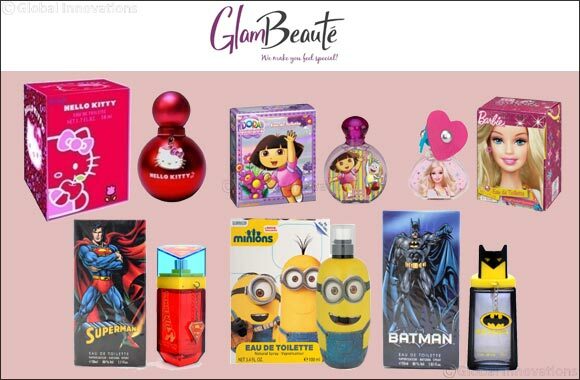 Some of our top fragrance picks available @ Glambeaute.com include Warner Brother’s Superman, Batman and Minions EDTs for the boys and Barbie, Hello Kitty and Dora EDTs for the girls.